Product prices and availability are accurate as of 2019-04-10 12:02:11 UTC and are subject to change. Any price and availability information displayed on http://www.amazon.com/ at the time of purchase will apply to the purchase of this product. Dishwasher safe for easy cleanup, these Calphalon Contemporary Nonstick Fry Pans are created with multi-layer nonstick for ultra durability. The stunning, contemporary design looks beautiful in the kitchen, and heavy-gauge, hard-anodized aluminum ensures even heating. 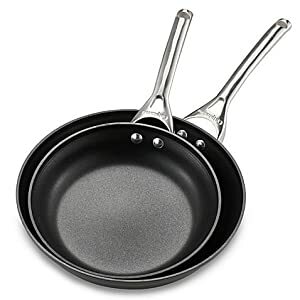 With their thick, flat bottoms and gently sloping sides, the 10-inch and 12-inch Fry Pans are perfect for preparing eggs and omelettes, sautéed vegetables, and more.